After you click the leads list button on the top toolbar, you should see a screen that resembles the one below. This screen resembles the customer list and works in the same way. 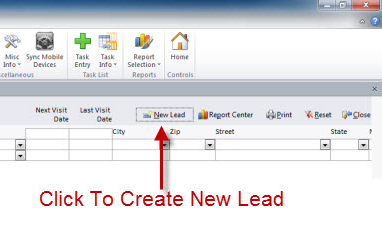 To create a new lead click the "New Lead" button as shown below. This will take you to the lead detail screen where you will be able to create a new lead. Below is the lead detail screen. The 2 main areas to focus on are outlined in the picture below. The box labeled "B" contains the buttons: create a quote directly from the lead, email the lead, create new lead, add lead to QuickBooks and print. 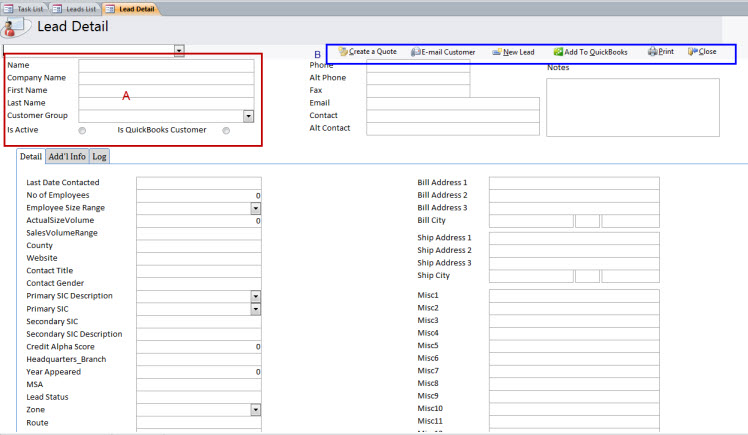 Below box "a" are custom fields that can be populated with any data you wish to keep a record of for this lead.